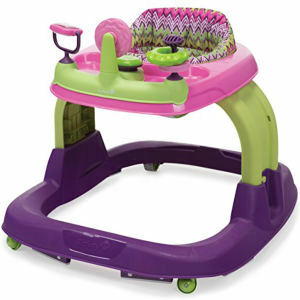 Available in eight cheerful color schemes, the Safety 1st Ready-Set-Walk baby walker will keep your young child active and joyful from the morning until the nap time. Its manufacturer, Safety 1st, went above and beyond in making this walker safe, practical, and, above all, useful. Combining durable, stable construction with fun activities for children across multiple developmental stages, the Safety 1st Ready-Set-Walk baby walker is a well-deserved success. The foundation of this walker is a sturdy base with four wheels that works great both on low-pile carpet and hardwood floors. Attached to the base are two strong arms that carry a padded, machine-washable seat and an activity tray with an assortment of fun toys. The arms are adjustable, offering three settings that ensure that your child won’t outgrow the walker anytime soon. The activity tray comes with toys designed to capture the imagination of all young children, and they can even stimulate the child’s visual and auditory senses with songs and a built-in LED light. When you’re done playing, you can quickly disassemble the walker and store it in the closet or under the bed. The tray has no crevices, so it can be easily wiped clean before the next play session. Is the Safety 1st Ready-Set-Walk baby walker BPA-free? Safety 1st Ready-Set-Walk baby walker is made entirely using BPA-free plastic, so there’s no reason to be afraid if your child finds some of the toys to be irresistibly tasty. What if I lose a toy or damage the one that came with the walker? There’s no going around it: small children test every toy to its limits. If your child ever loses or damages a toy that came with the Safety 1st Ready-Set-Walk baby walker, you can order a replacement by contacting the manufacturer at 1-800-544-1108 or letushelp@djgusa.com. What are the heights of the three settings? The walker can be set at 6.5 inches, 7.75 inches, or 9 inches, measured from the seat bottom to floor. Which songs does the walker come with? Your child can listen to Hush Little Baby, Who’s Afraid of the Big Bad Wolf, Twinkle Twinkle, Home on the Range, Muffin Man, Little Tea Pot, My Darling Clementine, Have you ever Seen a Lassie?, Rock a Bye Baby, 3 Blind Mice, Farmer in the Dell, and B-I-N-G-O. How often do I need to replace the batteries? The battery inside the walker is non-replaceable (for safety reasons) and is designed to outlive the walker itself. In case you want to resell the walker or give it to someone else, you can order the entire sound and light button at 1-800-544-1108 or letushelp@djgusa.com. Is it possible to lock the wheels? None of the four wheels can be locked. It’s also good to keep in mind that only the front pair swivels. Can I take off the toy bar? After a particularly messy play session, you may want to take off the toy bar and scrub it under running water. With a flat-tip screwdriver or another similar instrument, push the three top plastic prongs under the tray until it pops out. How well does the walker turn on a carpet? The walker turns equally well on most low-pile carpets as it does on hardwood floors. High-pile carpets, however, may create so much resistance that your child won’t be able to overcome it. Where is the Safety 1st Ready-Set-Walk baby walker made? 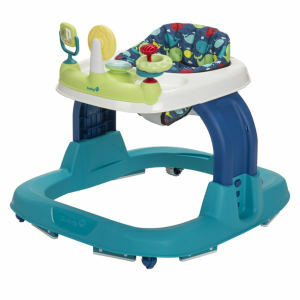 The Safety 1st Ready-Set-Walk baby walker is made in Columbus, IN.